Call them “Custard Apples” call them “Kentucky Bananas” or just call them Paw Paws; the ripening of the largest native fruit signals fall in the Appalachians. 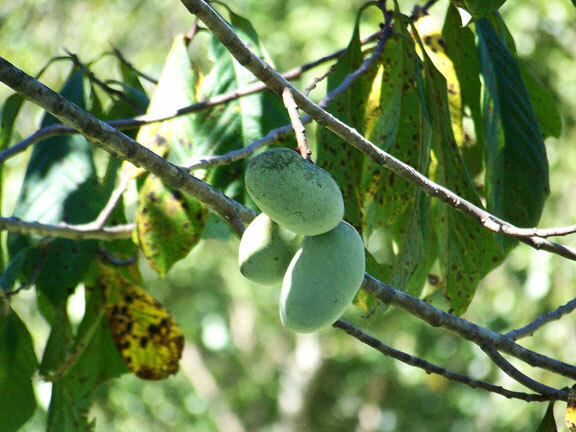 Paw Paws, Asimina tribola, are found growing in colonies often along the creeks or pastures here in Kentucky and throughout much of the southeast, even reaching up into Indiana, Ohio and Michigan. If you have never tasted the fruit, it’s really hard to explain; kind of creamy and sweet like a banana, mellow but with some tropical kick perhaps like a mango. Some folks throw in a pineapple flavor as a descriptor….but not me. I think it tastes like fall in Kentucky. Paw Paws fit comfortably into my hand, not much bigger than an apple. On the tree they are a beautiful apple green, but depending on the variety they can be more white. As they ripen, they take on a yellow tinge. The shelf life of a paw paw is short, perhaps three days. When ripe, the fruit falls to the ground. But hillbillies like me know a secret. When a Paw Paw is over-ripe, the flavor and aroma are at tantalizing peak. You know how a over-ripe banana has concentrated flavor? That’s the way it is with paw paws. We folks “in the know” separate the black fruits out, either freezing immediately or peeling and eating right in the field. Heavenly! Paw Paws have a short season, start looking for them now and they will continue to be around until early October. Here in Kentucky, foraged paw paws can be found at many of the big city farmers markets and even at a few specialty stores. Paw Paw pulp can be frozen for later use with much success. Peel, remove the seeds, and freeze like you would bananas. Paw Paw custard pies are a traditional dessert, as are paw paw cake breads and muffins. The pulp is wonderful on paw paw ice cream, or incorporated into a milk shake. University of Kentucky Agriculture Ambassador, Bob Perry suggests a paw paw cCrème brule..
Kentucky State University in Frankfort is known for their paw paw research. In fact, they are the world’s only full time paw paw Research facility. The University houses a large collection of paw paw seeds, plus and area devoted to grow outs and production. There are numerous cultivars of Paw Paws out there. Please do not go digging them the native ones, they do not transplant well. Check with your local nurseries for cultivated sources.